The Koleos has Renault's upscale styling cues such as a prominent grille. 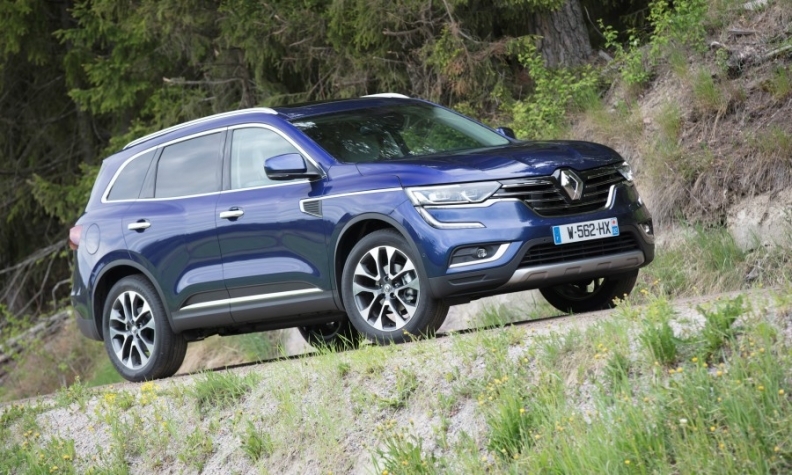 Renault is counting on high-end features to make its new Koleos SUV more successful in Europe than the slow-selling previous model. The Koleos gives the brand a competitive midsize SUV at a time when European consumers are turning away from similarly sized sedans and station wagons. The first-generation Koleos, which is slightly smaller and less-SUV oriented than the new version, was a strong seller in China but failed to make much of an impact in Europe, with fewer than 5,000 units sold in the region in 2015, the last full year of sales. The Koleos’ styling echoes the Talisman midsize car, with short overhangs, a prominent grille and large logo, and a similar beltline, though Koleos drivers will sit 150mm higher. Those cues send a signal that the Koleos is part of the brand’s high-end range, Renault says. European buyers can order an upscale Initiale version, which has 19-inch wheels; Nappa leather seats, steering wheel and gearshift; wireless mobile phone charging; and laminated side windows to reduce noise. The 4670mm-long Koleos is entering a segment forecast to pass annual sales of 300,000 units in Europe by 2020, up from 167,000 last year, said JATO Dynamics analyst Felipe Munoz. The leaders in the segment are the Nissan X-Trail, Mitsubishi Outlander, Skoda Kodiaq, Ford Edge, Hyundai Santa Fe and Kia Sorento. New contenders include the Peugeot 5008 — restyled as an SUV from a minivan — and two entrants from Volkswagen Group, the VW Tiguan Allspace and a forthcoming Seat model. European buyers will have only diesel powertrain options in the Koleos. Renault added some features to the Koleos specifically for the European market. “These adaptations are for comfort, soundproofing and the creation of the Initiale version, which is unavailable in other markets,” Cousein said. European buyers will also have only diesel powertrain options because Renault says very few buyers in the segment opt for gasoline. “If the demand is there, we will be able to add a gasoline drivetrain,” Cousein said. While some competitors offer a third row of seating, Koleos buyers will have to make do with two rows. Renault says it already offers several seven-seat models, including the Espace and Grand Scenic minivans. Off-road ability: The Koleos has a ground clearance of 210mm and approach and departure angles of 19 and 26 degrees, respectively. Four-wheel-drive models have an auto mode that directs up to 50 percent of torque to the rear wheels and 4wd lock, which distributes torque equally to the front and rear at speeds up to 40 kph. Technology: Driver assistance features include an active emergency-braking system, lane-departure and blind-spot warnings, traffic-sign recognition as well as parking sensors and hands-free parking assist.